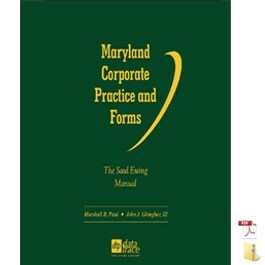 Prominent Maryland attorneys, Marshall B. Paul, John J. Ghingher III, and Jacqueline A. Brooks, provide insightful and instructive discussions, analyses, and strategies for virtually every corporate law situation you may encounter in this dynamic Manual featuring more than 115 electronic forms. This exhaustive Manual, with its 1380+ pages of valuable content, will help you stay current and efficient by providing appropriate statutes and regulations – complemented by thorough discussions and analyses of any changing federal or Maryland state laws. Plus, you’ll be expertly guided through an extensive selection of appropriate corporate forms, using an easy-to-follow format. Included are customizable e-forms, plus planning strategies for a full range of corporations from closely-held private companies to large public companies. Newly revised Chapter 5, dealing with “Fundamental Changes,” addresses the fact that Maryland no longer requires the filing of Articles of Transfer but still includes sales in the category of fundamental transactions. New form of board resolutions advising a transfer of assets. New section dealing with the elimination of the need for articles of share exchange in cases where the share exchange is undertaken by voluntary action. Discussion of changes to the law dealing with transfers of assets by dissolved corporations. Marshall B. Paul focuses his practice at Saul Ewing LLP on counseling businesses, health care concerns and professionals with respect to limited liability company matters, general corporate matters, joint ventures, acquisitions and sales, fiduciary duty issues and financings. His clients include large-scale health care providers, technology companies, distributors, service providers and manufacturers of various sizes as well as individual health care professionals and other professionals. Mr. Paul is an adjunct professor at the University of Maryland Law School, where he and Mr. Ghingher lecture on partnerships, corporations and limited liability companies. A co-author of the Maryland Limited Liability Company Act, he served on the American Bar Association committee that drafted the ABA’s original Prototype Limited Liability Company Act. Mr. Paul has lectured both locally and nationally regarding limited liability companies and other legal matters. He has co-authored numerous articles on limited liability companies and other legal matters, as well as a widely used book on limited liability companies. Mr. Paul was named the “2012 Washington/Baltimore Corporate Law Lawyer of the Year,” The Best Lawyers in America, and is consistently named to The Best Lawyers in America list, Corporate Law, Woodward/White. John J. Ghingher, III practices general business law at Saul Ewing LLP, with an emphasis on the representation of private companies, nonprofit organizations and real estate investment trusts. He handles the formation of all types of business organizations as well as the planning, governance and transactional needs for business of all sizes. In his years of practice, Mr. Ghingher has represented clients in mergers and acquisitions, financing transactions, and the negotiation, preparation and review of business agreements of all kinds, including distributorship agreements, employment agreements, franchise agreements, technology and computer software licensing agreements, advertising agreements, supply agreements, sales agreements, non-competition agreements and management agreements. Mr. Ghingher assists the owners of business companies with their succession planning and the preparation of the agreements necessary to implement the resulting succession plans, coordinating these efforts with the estate planning of the business owners. He also represents nonprofit organizations in their governance and transactional matters. He is counsel to the United Way of Central Maryland, and has assisted many new nonprofits in their organization and growth stages, and with transactions of all kinds. Mr. Ghingher has advised REITS in numerous transactions, primarily as Maryland counsel, including acquisitions, financings and public offerings, and has assisted them in addressing various issues of Maryland REIT and corporate law. He serves as an Adjunct Professor at the University of Maryland Law School, where he and Mr. Paul teach a course on Business Associations. Jacqueline A. Brooks concentrates her practice in general business and commercial law at Saul Ewing LLP. She counsels clients in mergers and acquisitions, purchases and sales of businesses, commercial finance, private offerings of debt and equity securities, and life science transactions. Jacqueline has experience representing public companies, privately owned and managed companies, nonprofit organizations and start-up companies and provides general counsel to these organizations regarding corporate matters. Prior to joining Saul Ewing, Jacqueline participated in Washington University School of Law's D.C. Clinic, through which she was an intern to the United States House Judiciary Committee. In this capacity, she drafted legal memoranda to assist Congressman John Conyers, Jr. and the Congressman's legislative assistants at Judiciary Committee hearings and briefings. Ms. Brooks has advised buyers and sellers in mergers, asset purchase and sale transactions and stock purchase and sale transactions. In these matters, she has represented numerous private companies, public companies and start-ups, and has worked on international and cross-border transactions representing clients in a variety of sectors, including manufacturing, construction, retail, healthcare and life science. Ms. Brooks has handled secured and asset-based lending transactions and unsecured lending transactions for many clients in various industries by assisting with the drafting, negotiation and structuring of commercial loans. Ms. Brooks represents a number of publicly traded New York Stock Exchange Real Estate Investment Trusts and advises them on offering transactions, finance transactions and corporate and REIT governance matters. She has advised REITS in connection with initial public offerings. She often acts as Maryland REIT counsel in these transactions. Ms. Brooks has represented companies raising private equity and venture capital funding, whether through debt or equity transactions. During these transactions, she assists clients with drafting and negotiating various transactional documents such as stock purchase agreements, voting agreements, warrants, subscription documents, private placement documents and other investment documents. In addition, she handles legal due diligence or responding to due diligence inquiries regarding debt and equity transactions. Ms. Brooks also serves as general outside counsel to many private companies providing day-to-day counseling, corporate governance and contracts advice. In this capacity, she often provides advice on formation, operation and governance of corporations, limited liability companies and partnerships.